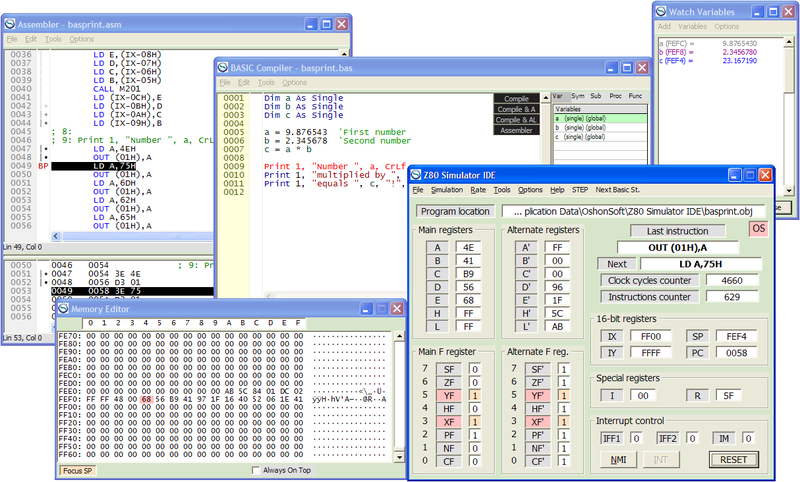 Z80 Simulator IDE is powerful application that supplies Z80 microprocessor users and educators with user-friendly graphical development environment for Windows with integrated simulator (emulator), z80 basic compiler, assembler, disassembler and debugger for the Zilog Z80 8-bit microprocessor. You are welcome to download the fully functional evaluation copy of the software on the downloads page. Z80 Simulator IDE requires a license to operate after the evaluation period. For more information please visit the licenses page. - Onondaga Community College, State University of New York, United States. Many thanks to Prof. Ramesh S. Gaonkar, the author of famous Z80 textbook 'The Z-80 Microprocessor: Architecture, Interfacing, Programming, and Design'.